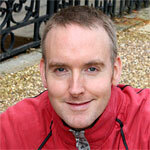 Our corner of the Surrey Hills is increasingly home to companies and businesses serving the cycling industry. From the popularity of the Peaslake Village Stores, to Pedal and Spoke (rumoured to be the UK’s largest Santa Cruz dealer), other independent cycle shops like Cycleworks and Head for the Hills, to our very own Biketech mobile bike mechanics, there’s plenty of people making a living off the massive growth in popularity that the cycling has experienced over the past years. One of these companies is Intrepid Apparel. Intrepid Apparel are based in the Guildford/Godalming area and design some of the best – and most distinctive – MTB clothing that I’ve seen for a long time. A little over a year ago I was sent a pair of Campaign shorts and their Classic Race jersey for review and it’s time to give a long term report on the shorts (expect a jersey review soon). 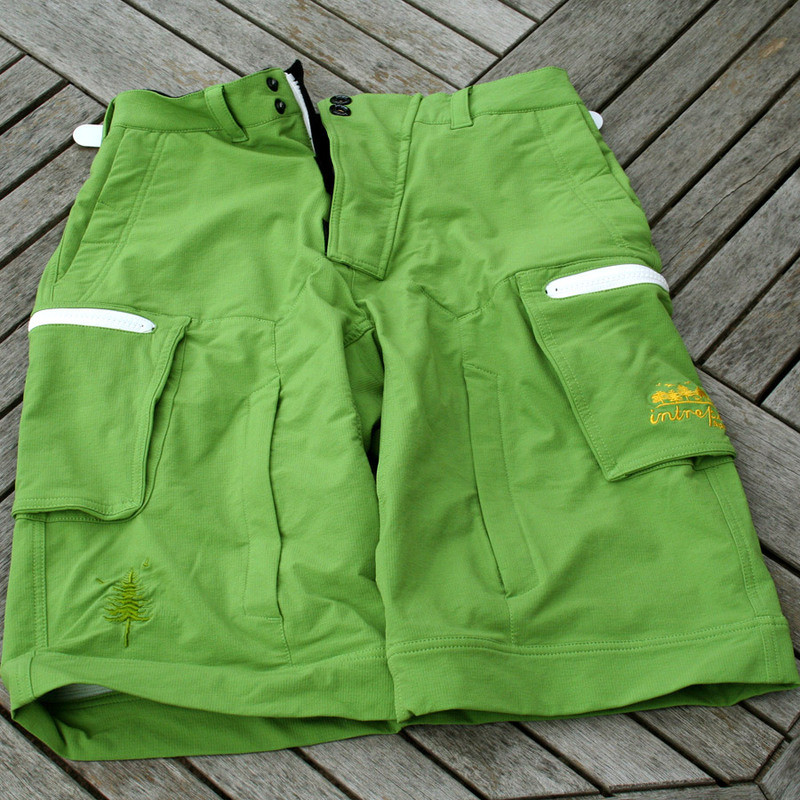 One look at the photos tells you why these shorts are distinctive, the funky lime green really gets your attention. You have to see these shorts to believe them as my photography skills don’t really do them justice. In truth, the reality is nowhere near as eye-searing as you might think but there is also a black version available if you prefer. Whichever colour you favour, there’s much more to these shorts than their attention grabbing looks first suggest. Over the past year these shorts have been one of my favourite items of clothing, proving time and again that good design pays for itself many times over. They have been crashed on, ragged through the worst that the Surrey winter could throw at them, soaked in Welsh water and grit at Llandegla and Penmachno and still look pretty much as good as new. The Campaign shorts, as you might guess from the name, are designed for the gnarlier end of the spectrum, targeted at Freeride and Downhill types. For this reason, they feature a generous cut to allow plenty of room for body armour underneath – I use a pair of venerable Kyle Strait 661 knee pads without problems but there’s plenty of room for more padding than that if you’re throwing yourself down a steep and unfamiliar hillside. On the flipside, you can just as easily ride these for the kind of Surrey Hills riding we do – sort of aggressive XC for want of a niche to jump into. It’s worth saying a word or two about sizing though. All that extra space for armour means these shorts come up quite large; I have the medium and need to cinch the shorts down as tight as I can to stop them slipping down thanks to my 32″ waist. Less under-nourished riders, or those running heavy padding need not worry but think about going a size smaller if in doubt as there’s plenty of growing room. If you are less gravity oriented you could always consider the Mission shorts instead which are cut slightly narrower overall. The details that really set these shorts apart for me are numerous and rather subtle. Hard wearing we’ve already covered, but the Campaign shorts also come with magnetic snap closures on the pleasantly fleece lined hand pockets which seem to stay shut no matter what. I still get a buzz out of feeling the pockets snap shut even after a year of use! 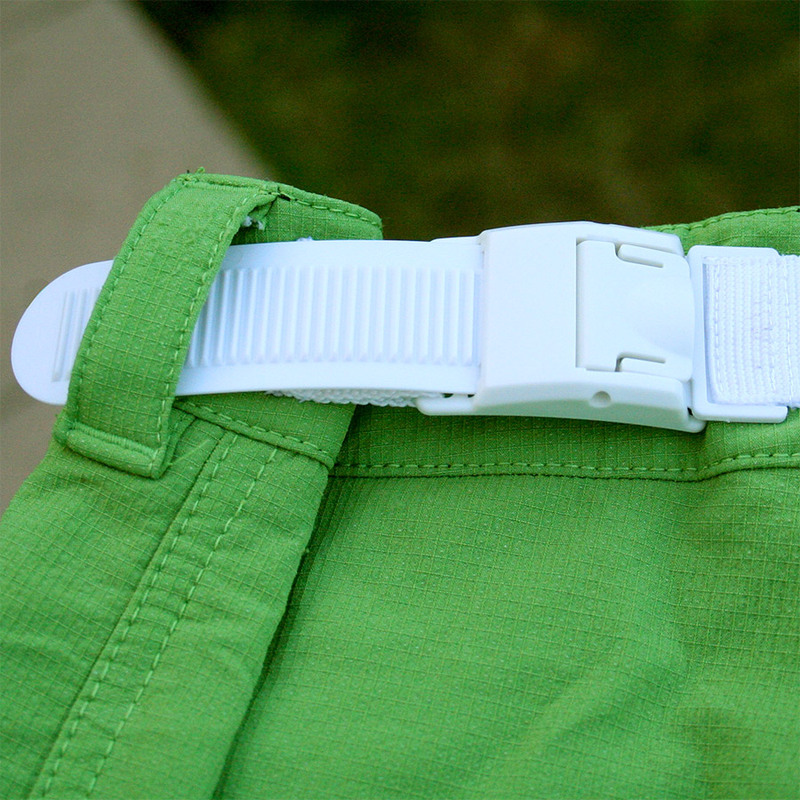 Further pocket security is provided by chunky zips on the cargo pockets on each leg, as well as on the shorts’ fly and rear centre pocket. 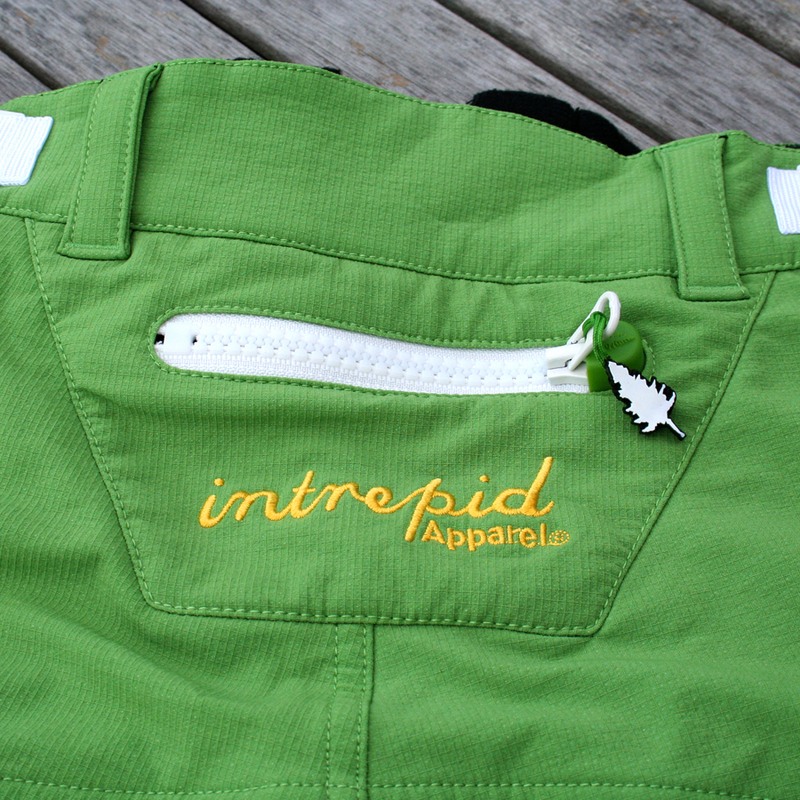 These oversized zips – complete with fir tree tags – are seriously heavy duty and provide a robust and reliable closure. You’ll want to make sure these cargo pockets are closed too as you can fit a lot in – there’s a fleece lined phone pocket on the right leg and a metal carabiner in the left for storing keys, plus enough room to smuggle (very small) refuges – or perhaps ferrets – across Continental borders should you wish to do so. The practical details don’t end there. The three way stretch material gives way to mesh lined thigh vents for riding in warmer weather while the fly is armoured not just with one of those oversized zips but velcro tabs and double poppers. Belt loops are present but most of the adjustment to the fast wicking waistband comes in the form of large ratchet adjusters on either hip which do a great job of snugging up the waist, especially useful if you happen to be wearing hip or leg padding or have ‘big bones’. As you can tell, I’m very pleased with the Intrepid Campaign shorts. They have proved hard wearing, eye catching and have a lot of unusual but useful details that most rivals can’t match. Good design is so much more than the visuals and the fact that all that design thinking is happening just down the road from us is a bonus really. You might also want to check out my review of the Intrepid Apparel Race Jersey. All true matt. As you know I have had a pair of these (in black) for a while now and the quality of the material is impressive. More pockets than you can shake a stick at, or ferret(s), but I do agree the sizing is voluminous if you are of a normal build and not padded up for gnarr shredding duties. So far no probs with any of the pockets, zips, waist adjusters and the back end has not worn through so all good.